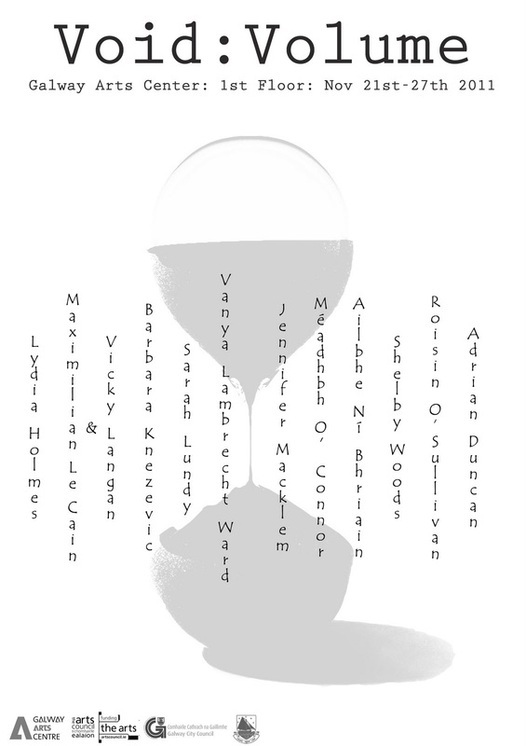 Void:Volume is a group exhibition of national and international artists curated Sarah Lundy and assisted by GAC artist in residence Roisin O'Sullivan. Artists were selected from an open submission call, in which they were asked to consider and challenge contemporary notions of creation given the visual and literally cues from the story of Genesis. The resulting exhibition depicts an exploration and reflection on the creative compulsion and modes of making today. ideas we all have and want to share. The concerns around represesenting ideas are the same, as is the creation. The realm of Fine Art is suspended momentarily, though operated within completely, as we are asked to take a fresh look at what we make without reference to a specific 'why' beyond that innate compulsion to do so. The title Void:Volume relates to the pregnant potential of absence and the momentive coming to being of presence, emptiness and that initiative and urge to fill it. There is always interconnectivity between some and none. The degree to which artists create objects is relative and that which remains unmade is still available, ever valid until realisation. Nothingness has its own volume, it is a void that humans are compelled to fill. Galway Arts Centre is supported by the Arts Council, Galway City Council and Galway County Council.